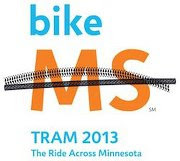 More than 700 cyclists will come through Minnesota’s Iron Range this month as part of the Bike MS: TRAM Ride (The Ride Across Minnesota), arriving in Biwabik on Friday, July 24, then traveling to Hibbing Saturday, July 25, and departing Sunday, July 26. In Biwabik, many of the participants will camp near the ball field; in Hibbing, campers will congregate at Bennett Park, which will also serve as the event headquarters. Cyclists will be arriving from Biwabik along the Mesabi Trail, a relatively short ride for most participants, and reaching Hibbing between 10 a.m. and 1 p.m. At both locations, food vendors and local massage therapists will be onsite to welcome the cyclists, and entertainment will take place in the park during the afternoon and evening. Residents are invited to stop by the park to welcome the TRAM Ride participants and enjoy entertainment. In Hibbing, a $5 bus pass will be available for cyclists who wish to explore the area. Shubat Transportation is providing buses on a route to area hotels, restaurants and retail, as well as for an “attractions tour” that includes stops at the Hibbing Historical Society Museum, Hibbing High School, Hull-Rust Mine View and the Greyhound Bus Museum. The Hibbing City Band is slated to perform at Bennett Park in the afternoon, with evening entertainment by Amy Grillo. Entertainment is also on tap in Biwabik, with John Stark performing from 3-5 p.m., and Jay Hoiland performing from 5-7 p.m. In its 26th year, the event is expected to raise more than $700,000 to accelerate research breakthroughs aimed at finding solutions for people with multiple sclerosis and provide lifechanging services to families affected by the disease. Funds raised benefit the National MS Society, Upper Midwest Chapter, which serves more than 17,000 people with MS and their families across Minnesota, Iowa and North and South Dakota. DAY 1: Thursday, July 23: Cyclists check in at the Proctor Fairgrounds in Proctor, Minn., and settle in for the first overnight. The fairgrounds serve as the start and finish point for all riders. DAY 2: Friday, July 24: The cycling journey begins with a ride to beautiful Biwabik, Minn., a unique, Bavarian-style town home to “Honk the Moose” and trailhead of the historic Mesabi Trail. DAY 3: Saturday, July 25: After a scenic ride along the Mesabi Trail, cyclists arrive in the town of Hibbing, Minn., heart of the Iron Range. DAY 4, Sunday, July 26: Cyclists ride to Spirit Mountain in Duluth, Minn., where three-day riders bring their 200-mile adventure to a close and five-day riders rest up for another day. Cyclists opting for the three-day ride will enjoy a festive finishline celebration and a welldeserved shuttle ride to the Proctor Fairgrounds. DAY 5, Monday, July 27: Cyclists pedal across the Sawtooth Mountains en route to the gorgeous Lake Superior port town of Two Harbors, Minn.
DAY 6, Tuesday, July 28: Cyclists complete the 300-mile trip with a journey down Minnesota’s famous Old Hwy. 61, along the shores of Lake Superior and back to the Proctor Fairgrounds. The Society addresses the challenges of each person affected by multiple sclerosis. To fulfill this mission, the Society funds cutting-edge research, drives change through advocacy, facilitates professional education, collaborates with MS organizations around the world, and provides programs and services designed to help people with MS and their families move their lives forward. In 2014 alone, the Society invested $50.2 million to support 380 new and ongoing research projects around the world, while providing programs and services that assisted more than one million people. The Society is dedicated to achieving a world free of MS. The National MS Society, Upper Midwest Chapter represents more than 17,000 people with MS in Iowa, Minnesota, North Dakota, South Dakota and several counties in western Wisconsin and Nebraska. Join the Movement® at nationalMSsociety.org. Early and ongoing treatment with an FDA-approved therapy can make a difference for people with MS. Learn about your options by talking to your health care professional and contacting the National MS Society at nationalMSsociety.org or 1-800-344-4867. DEADLINE for submissions is one week prior to publication. Send to: jeanc@hometownfocus.us.